Looking for a Big Ding board repair set? Kitemana! 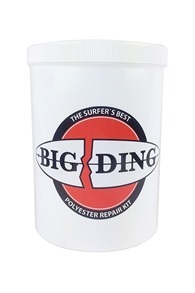 Big Ding is a surf brand that makes repair products for surfboards and kiteboards. 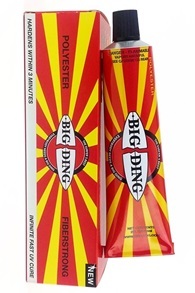 Both polyester and epoxy boards you can easily fix yourself with the Big Ding products. Apply the mixture to the board and let it harden in the sun, before you know it you can get back on the water again. 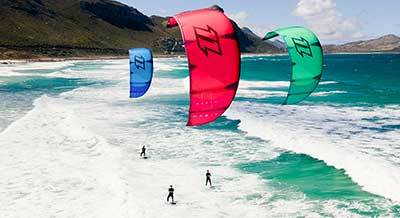 For more info check the repair sets or visit our kiteshop. Big Ding is also useful for traveling and repairing boards on the go. Did you break your surfboard and do not want to say goodbye to your old friend? Then Bing Ding offers you a very good solution. Bing-Ding offers a handy do it yourself kit to make your surfboard as good as new. 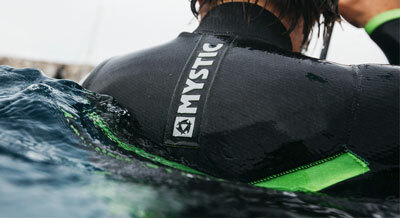 With this you can easily and quickly make your surfboard (or kiteboard) yourself. These Big Ding board repair sets are perfectly equipped with everything you need to professionally repair your board. You will of course receive useful instructions to make repairing even easier. The sets also includes handy cups with screw caps. This allows you to immediately store the set untill you are ready for the next repair!